I started out making my own hand soap, from Heavenly Homemakers, which we love. Then I started making our laundry soap here, as well as our own dish soap and spray cleaner. Last summer we started making our own lotion…and I just ordered stuff to make both bar soap and shampoo bars. I am still a rookie at this stuff…and I have alot to learn…but we have a good start and I’m hooked. My reasons for adding this to my already full plate: 1) It’s fulfilling to be able to be more self sufficient. 2) Fun activities with your kids. 3) A non-toxic alternative in a very toxic world. 4) little/no plastic packaging or waste. 5). Cost/frugality…and 6) ….just because I can. Ok, so back to the aforementioned lotion. 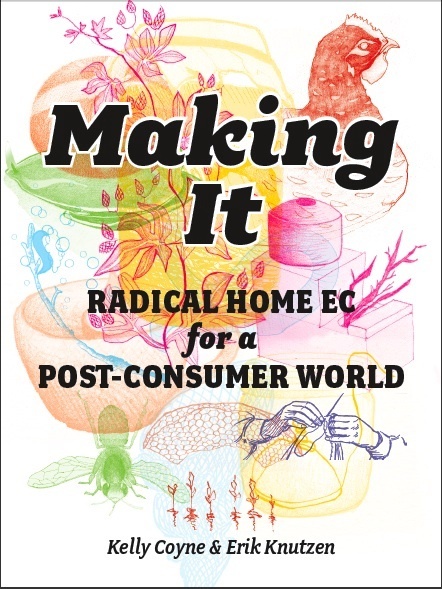 I got this GREAT book for my birthday: “Making It: Radical Home Ec for a Post-Consumer World” by my favorite “Urban Homestead” couple Kelly Coyne and Erik Knutzen. I love this book. They break down projects from “Day to Day”, “Week to Week”, “Month to Month”, etc. The book covers everything from composting, beekeeping, gardening, making your own mead wine, and hygiene items like…well…lotion (and more)! A clean dry jar, enough to hold 2 cups of cream. I will add that using a wide mouth mason quart jar is a smart bet. The small mouth ones…not such a smart bet. Live and learn. 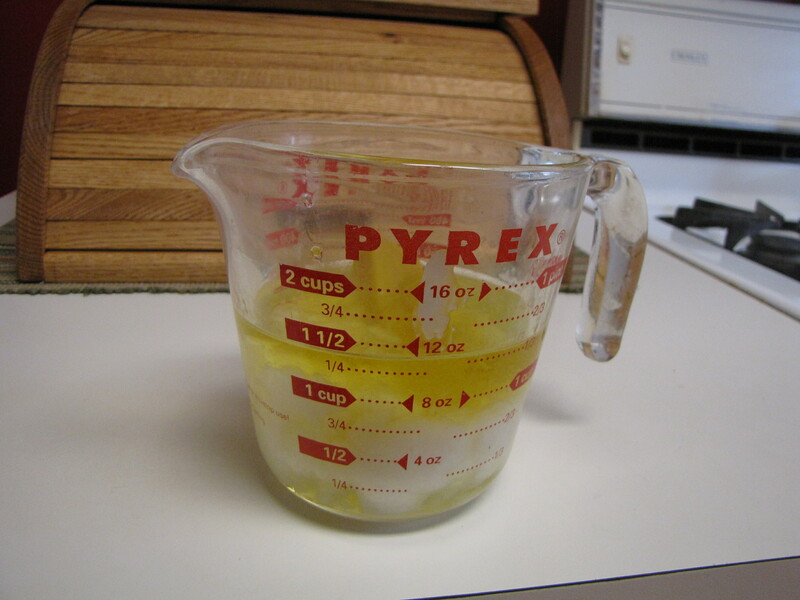 Measure and combine the oils and wax in a Pyrex liquid measuring cup. Pour in the olive oil until you reach the 6 ounce line, then add the coconut oil until the oil level rises to the 8 ounce line. Add the beeswax until the liquid reaches the 9 ounce level. Then put the cup in a sauce pan of simmering water. 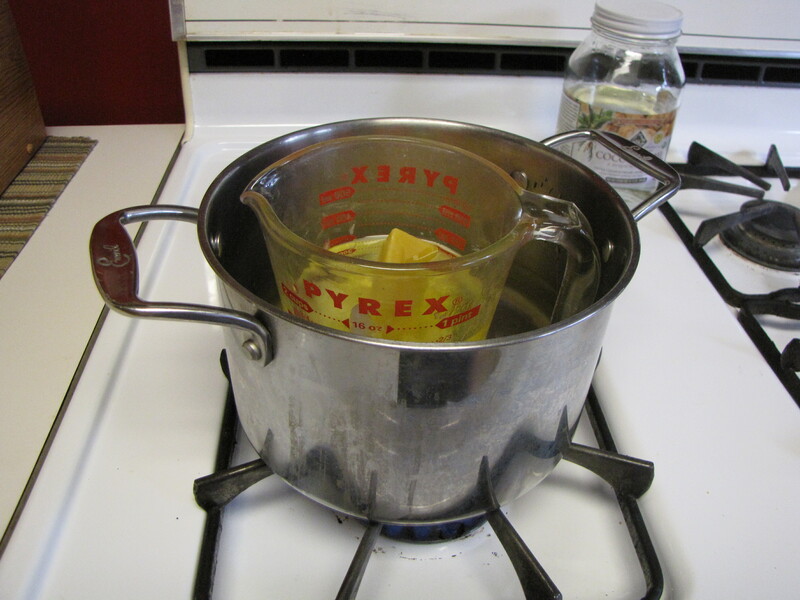 Heat the oil and wax over simmering water, stirring occasionally, until the wax is totally melted. Take the pan off the heat and stir in the essential oils. If you’re not going to start mixing right away, let the melted oils and wax sit in the water bath, off the heat, so it stays warm. 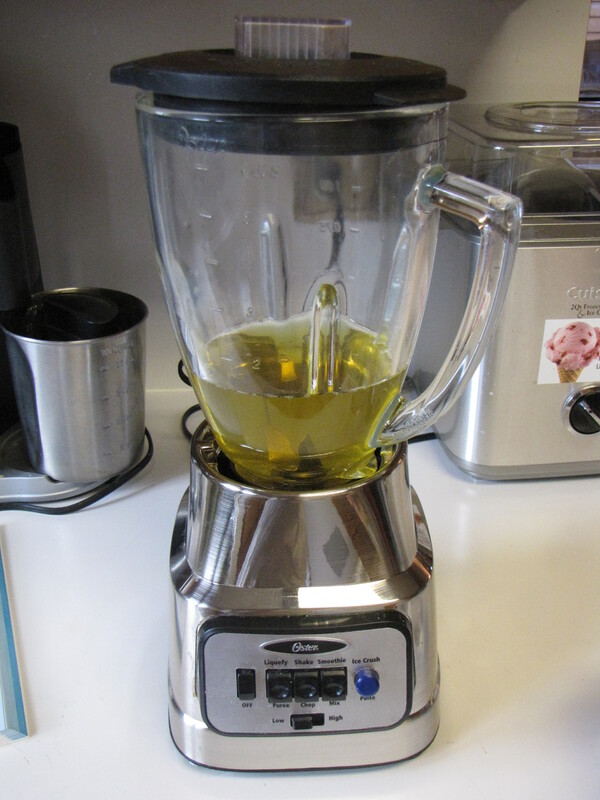 While the wax is melting, pour 2 cups or so of boiling water into a blender to prewarm it. This will stop the wax from solidifying on the blender walls. Measure out 1 cup of room temp water. Be prepared for the next step as it happens quickly. Empty the boiling water out of the blender or mixing bowl. Pour in the hot oil. Start the blender and pour in the water in a steady stream. I took the top removable plastic handle out of the lid and poured the water in through there. The oil will turn to cream right away. Some water may not get mixed in and will make the blender “choke”. Stop the blender, scrape down the sides, and start again. Repeat until it is smooth and blended. Stir around to make sure there’s no water hiding in the bottom of the blender. Stop when it is smooth. Store your cream in clean dry jars. The authors note that if you see air pockets in the filled jars, stir to remove the pockets as the cream will keep better that way. We have done two batches to date – one was very creamy and the other was more like a butter. Who knows why they are different, but we have been happy with it either way. I don’t believe I will go back to buying store bought lotion again. I should add that this recipe was NOT labor intensive. You can start the wax melting and walk away and do other things for a few minutes. I’d say from start to finish, it took us 20 minutes and that whole time we were not standing at the stove or blender. **I am not an affiliate for the links shown. They are simply there to help you find resources. Great post..I’m gonna try this…Does it separate as it sits? Thanks! Nope – it stays together well. Sounds like something I need to try! I’ve made hard lotion twice, and really like that. I’m starting to get into the whole soap making thing, and this is right along with those things. I love this kind of thing! Thanks 🙂 We love it too! Wahoo! Made it last night, and loved it! Took a little bit to work today, and everybody was impressed. Gave a little to a good friend, and she loved it, too. I might not ever, ever, ever (ever) buy lotion again! Thanks loads!!! Yay! Thanks for the feedback…and I agree about never ever ever buying lotion again. 🙂 have a great weekend! Can’t ask for a simpler recipe. Is the blender hard to clean even following your instructions? The only one I have is a Vitamix. Thx. Thanks 🙂 The only time I had a hard time cleaning it was the small mouth jar incident I briefly mentioned in the post :-). Impossible, just threw the jar. It does stick to the sides but mine cleaned out well with a little elbow grease. I can’t wait to try this! Need to get some beeswax. Could I sub out walnut oil for the olive oil? All respect to the Mediterranean, I can’t stand the smell of olive oil. I’ve heard walnut oil is great for the skin as a carrier oil, but haven’t tried it. I bought some to try, because I have eczema, and walnut oil is supposed to be healing. Thanks! I’m not sure…you could try it and let me know. 🙂 With respect to eczema – I had also read that chamomile is good – my next batch I’m going to steep the water added in loose chamomile tea and follow the steps from there. Good luck! Making It sounds like an excellent book! Your lotion looks really nice, and I like the tutorial you have provided too. It’s nice to know exactly what is in the things we put on our bodies, as well as in what we eat! I was so excited to try this! I have made lotion bars and lip balm with success and was looking for something a little lighter for the whole body. I just made my first batch and the water is beginning to seperate and extrude out. I’m not sure what I did wrong or how to fix it. Just tried this recipe. Not sure why mine is so watery… is it because I poured all the water at once? That could be – I think I poured mine in slowly. Someone else on here commented that something similar happened and the blended it more and it worked. You could try to scrape down the sides and blend and see if it blends then. Was the blender hot enough? Good luck – hope you can salvage it. Hi – responded to your other post – hope it works out! yes finally it works. I was using a hand mixer before and changed to a blender. Think I didn’t blend it enough so that’s why the oil and wax didn’t mix well. Thanks a lot for your follow up. 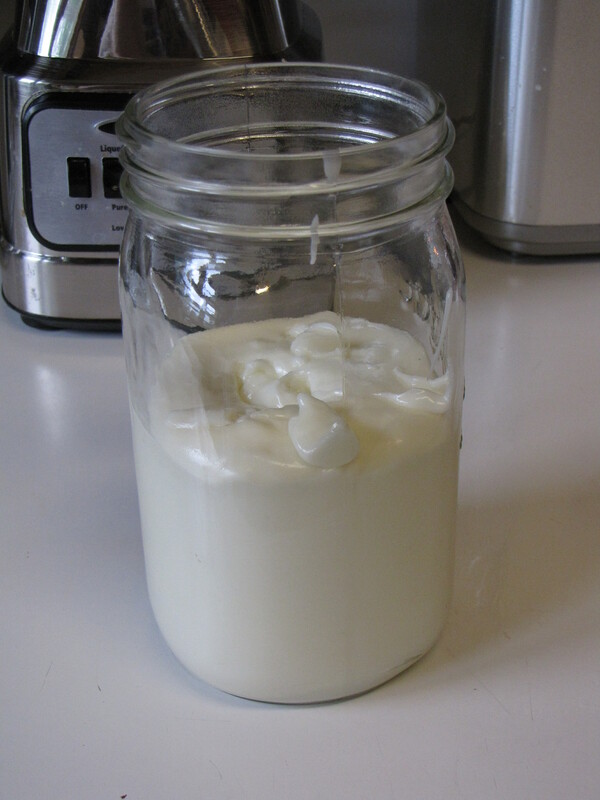 I love this DIY lotion recipe. So simple and easy to make. I love the idea of your recipe, and I’m a big fan of homemade products. My problem is that I’m allergic to coconut oil. I’m wondering if it will work without it? Or with another substitution? Seems like it might not work to sub out the coconut, as it has a different texture and is solid at room temp. I don’t know any other oils with that quality. What do you think? Thanks! I’m going to try that. I think cocoa butter this time of year would be GREAT! Have a great day! I am a soap maker… and I use babassu oil for people who are allergic to coconut oil. It has all the benefits of coconut oil without the allergenic effect. Plus some people complain about dry skin after long time use of coconut oil which hasn’t been reported with the babassu oil. It is a hard oil at room temperature. Beeswax is not an emulsifier. Also you need to weigh with a scale that measures in grams. Do not ever use rainwater, distilled only and you must heat and hold at 170 degrees for 20 minutes and lastly and most importantly, it needs a preservative. If you have a scrape, cut etc you can introduce bacteria and end up with a severe infection. Please, there are websites and forums with proper info for making lotion. Everything has to be sterile. Which would you rather do? Save money or prevent some horrid infection that will cost you more in medical bills? Thanks for sharing! I’m about to try this recipe, but I do have a VERY important comment to add. PLEASE don’t EVER walk away from wax when it’s melting on the stove for even for a minute!!! I made the mistake of leaving it on the stove while I went to the restroom and when I returned less than a minute later, my kitchen was in flames! This is why I now have a crockpot that I use for all of my wax-melting projects. Good idea with the crockpot and thanks for the heads up! We’ve been pretty careful so far but you never know when you can get distracted! Good luck! Do you think a stick blender would work? Thanks for this recipe. Just made it for the second time today. 🙂 I replaced the water with magnesium oil. You’re welcome….the mag oil is an awesome idea! Thanks for sharing! Just made this. Turned out perfectly! I’m so excited. Thank you! I was worried I would destroy my blender with the beeswax but your prewarming trick was perfect. Thank You for sharing this homemade lotion. I made it and it is great and easy to make. I will never buy lotion again. I loved it so much I went and got the book from the library, what a great book. Now I have to go buy the book. Thanks again! I tried this recipe last night and had a little trouble. It never quite got to the consistency of lotion. Nevertheless, I poured it into a pump bottle and have been using it. I find it to be oily. However, there’s a good chance it might have happened due to the ingredients I used. 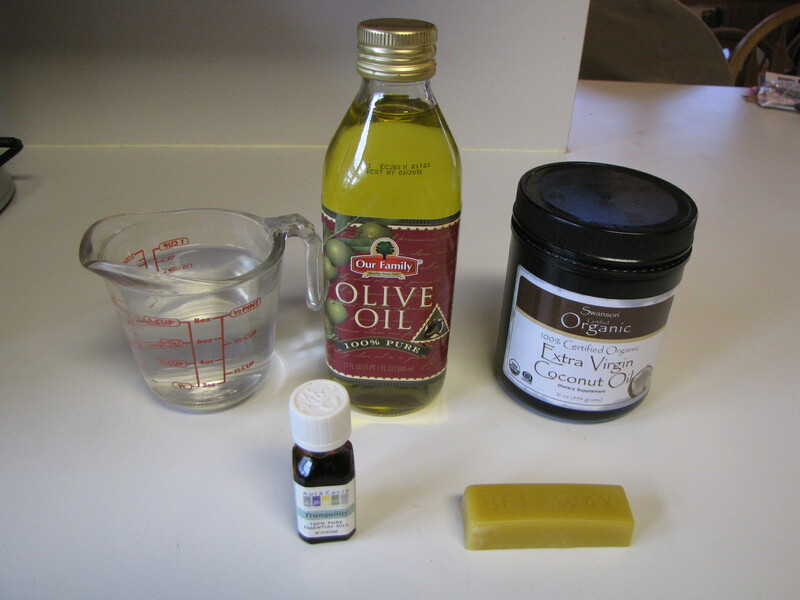 For the oil, instead of olive oil, I used a combination of sweet almond oil and baobab oil. Also, my coconut oil was not solid. When it became obvious that the lotion wasn’t going to firm up, I melted and added an ounce of emulsifying wax. That helped some. I have read sooooo many recipes and methods on the net and saw in several posts that cooling the lotion (I stuck it in the freezer for 10 mins) and blending again will sometimes tighten it up. I did that three times and it did work to some degree. Can you give me any advice? I chose this recipe because it looked like exactly what I wanted and I’d like to try it again. P.S. I used mostly lemon essential oil and a little lavender and peppermint and the fragrance is wonderful! I smell like lemon sorbet. I have only ever used generic brand pure olive oil, so I can’t comment on what happens if you use something else. I find that my consistency changes from time to time – I just made a batch and it was almost cakey (although I still like it) – I wondered if I used too much beeswax. For the coconut oil, did you use the kind that is liquid all the time? Just curious, I think that might make a difference too. I used the Swanson brand although I think any brand that solidifies would be OK. Just my thoughts – I’d try it again with the pure olive oil and see what happens. Mine tends to be creamy and thick, and it does get oily so I usually use it at night – although I use it as face lotion (and strangely enough it seems to curb skin breakouts). Good luck! Just wondering when the lotion has been blended and cooled, when u use it, water drips out of it. Should I try blending it again? Beeswax is not an emulsifier ! Not using preservative in something that contains water is irresponsible and unsafe! Bacteria and mold can grow in any product with water. If you have damaged or broken skin and you are risking a serious infection. Hi, I just made your recipe as per the instructions and it’s turned out the consistency of runny custard. i tried adding more beeswax but still doesn’t look or feel right. what can i do? I like that this recipe has no borax. I did tweak it a little… I used 4oz. each coconut oil, EVOO infused with comfrey & calendula, aloe vera juice and filtered water. I also threw in a small chunk of cocoa butter. To help prevent rancidity and bacteria growth, I added a few drops of vit. E oil to the oils and a few drops of grapefruit seed extract to the water / aloe mixture. I waited to add the essential oils until I was mixing it all together so as to maintain the therapeutic value of them by not beating them. The lotion did not thicken right away, so I placed my mixing container in a larger vessel of cold water and continued to mix. (I used a stick blender in a large mouth jar to blend.) it worked very well and I really like the lotion. It soaks in pretty quickly and doesn’t leave me greasy. Thanks for sharing and inspiring me to experiment with lotion again! Can this recipe be used in pump bottles? Hello. I saw your recipe today, and decided I needed to try it. About a week ago, I tried my first batch of coconut oil lotion, and I loved it. I just hated that its becomes a solid when the house is cold. I did tweak your recipe for me, and I used half olive oil and half canola oil. I also added castor oil and vitamin e oil, and lowered the water amount. It came out perfect for me, and have given it to some family and friends and they love it. Thank you for the recipe. I used a stick blender until it started to get a little creamier, then I used a whisk. It is perfect. I love the recipe and am happily sharing it with friends! I had a really hard time getting my blender clean again after. Any tips? Do you think an immersion blender would work well? That might be easier cleaning than my full size…. I have not tried the immersion blender myself, but it would be worth a shot. I make my mayo that way…and it’s a similar principle. I’m glad you liked it, and thanks for sharing!!! OMG! This is awesome and so easy to make. I also subbed magnesium oil for the water and did it all with a stick blender. I put the stick blender into a tall, wide mouthed vessel, poured in the hot melted oil and wax and, turned it on high and slowly added the magnesium oil. In less than a minute I had wonderful lotion. And, I’m pretty sure the mag oil will act as a tiny bit of a preservative. Thank you for a wonderful recipe!! Just wanted to update my review. The magnesium oil did indeed act as a preservative. I never put my lotion in the fridge; just left it in my bedroom and used it as needed. It was perfectly fine the whole time. I just ran out today and came back here to get the recipe again to make more and thought people might like to know how well it held up.